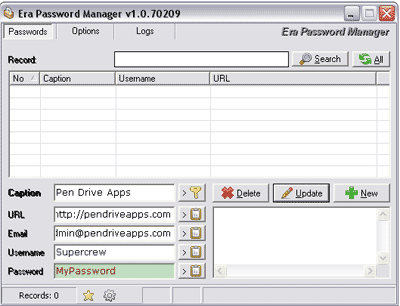 EPM Era password manager is a very easy to use portable password manager that allows a user to store all of his or her personal login information, user names and passwords in one database. Making it only necessary to remember one password. It can be run from a portable device enabling the user to carry valuable information with them in a protected state and retrieve the information securely using any computer.